Mark Saywell bought the 150 acre (60Ha) property at St Germains, north central Victoria, in 1998. 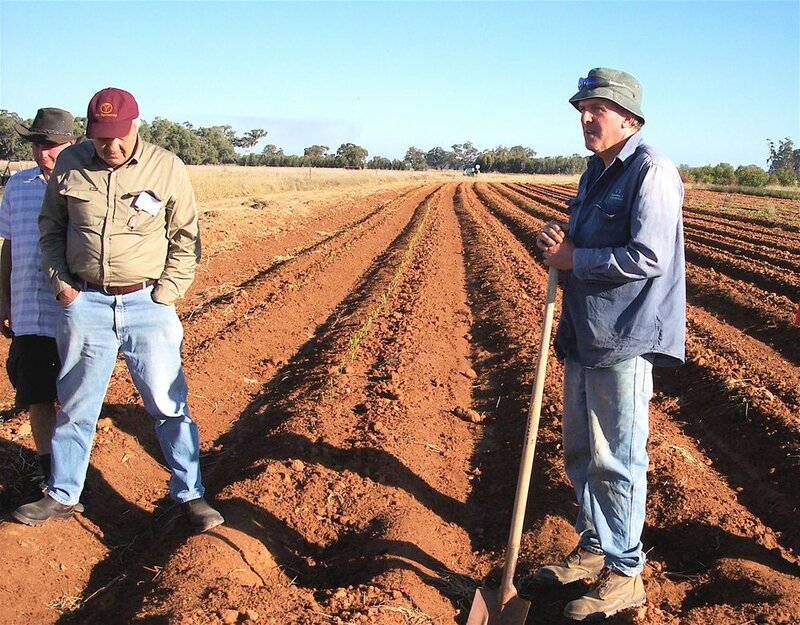 He had previously run a property in South Australia organically, and worked at a nearby Biodynamic orchard for years, so had the experience to effectively convert their new property to Biodynamics. He runs cattle, some sheep, and grow fruit and garlic. Mark started spraying prepared 500 soon after buying the property, and began planting a few acres of fruit trees. The property was part of an original station which had been reduced to 1000 acres of irrigated land. The block he chose to plant the fruit trees on had never been ploughed or cropped and was in good condition to start with. The tree rows were mounded to assist drainage (which is pretty good here anyway) and 2000 trees were planted, comprising Nashi pears, Corella pears, three varieties of apples and four varieties of apricots. Even though the soil in the fruit block was in good heart to start with, applying prepared 500 every spring and autumn has seen it steadily improve. The other parts of the farm, that were conventionally cropped have shown even more pronounced improvement as they were quite poor and compacted initially. Roots used to be constricted by compaction and lack of structure, but now penetrate deeply. Apart from an application of semi-composted Biodynamic cow manure 10 years ago (mainly used to bring in clover), Mark hasn't applied any fertilizers in the 15 years the orchard has been established. Bordeaux mixture (lime and copper sulphate) is used on the apricots at bud swell each year. There are no other orchards nearby, and there are very few codlin moths in the apples and pears. In this very sunlit climate, 501 is not often needed, but it is useful in unusually wet springs and summers. The orchard is irrigated through the growing season, and even during a prolonged drought, their 30% water allocation was enough to keep the trees producing. Mark just had to be more careful with their use of water, stopping irrigation as soon as the fruit was off the trees. The grass in the orchard is kept growing dynamically by cutting when it reaches an optimum height, with a mulcher mower. A whipper snipper is used a few times a year in the tree rows. In wet springs/summers the abundant growth of the pasture proved hard to keep up with so Mark attached a hydraulically operated outrigger to his slasher to deal with the grass in the tree rows. He had to move the irrigators off the ground to do this, and ran a wire along the rows to attach the irrigators to. The fruit is marketed through the Biodynamic Marketing Company in Victoria, and is also sent to Sydney and Brisbane organic wholesalers. Mark grew a variety of vegetables for a few years but now concentrate on garlic. At one stage producing 5 tonnes annually but because of intense market competition, he cut back to about half that. As there is plenty of space, he is able to rotate the garlic around, using the same spot again only once every five years. In the resting phase, many green manure crops are grown and worked into the soil. He doesn't graze the green manures, preferring to get all the fertility into the soil. Neighbours scratched their heads watching Mark plough a one metre high crop of oats and vetch into the ground in the middle of the drought! Under this system, no fertilizers are needed. The green manures are worked in slowly with discs. The last green manure before planting is left to mellow for a few weeks, then soil is pushed up using disc hillers, forming rough raised rows. Then it is left to break down for a few months before the garlic is planted. A single tyne ripper may be run down the middle of the rows if the ground is a bit hard underneath. Beds are formed with a bed former, and the garlic planted in April. Mark uses an old tomato planter with a feed, to bury T-tape (irrigation tape) 150mm below the surface of the beds. The tape has nodules spaced at 400mm and each nodule puts out 1.4 litres of water per hour. Mark installs a 50mm main across the middle of the 240 metre rows, feeding the T-tapes. Usually, 12 beds are planted, nearly 6 kilometres of row, at 2 rows per bed. Taps in the main line can direct water wherever it is needed. Sub-surface irrigation is good because it saves water and if it doesn’t rain, he doesn’t get weeds. Mark waters until the water just starts to seep out of the side of the beds. He used to grow a crop of beans after the garlic, to utilize the T-tape (the beans always grew beautifully) but now only grows the garlic. After the garlic is lifted, the T-tape is flipped out with a mouldboard plough. The farm was lasered in the past and soil was pushed down from the higher end towards the lower end. Thus the soil at the top was just hard clay to start with, staying in big lumps, and the garlic grew better at the lower end. However, with the use of prepared 500 twice a year for 19 years, the top end now grows just as well as the bottom and is getting better and more friable every year. Mark grows white and purple garlic. The purple has a higher allicin (medicinal component) content, but doesn’t keep as well as the white. The purple garlic is planted a few weeks earlier. Two small furrows are marked along each bed, with small tynes behind the tractor, and the garlic planted by walking down the rows and dropping the cloves in the furrows. If they fall upright that is ideal, but if some lie on their side it doesn’t matter. The furrows are closed (about 15mm of soil over the cloves) with a garden rake. Weed control is done with a Weedfix, made by Mike Fix (www.fixengineering.com.au), which mechanically weeds the furrows, the sides of the beds and between the garlic rows, when the weeds are very small. The Weedfix is adjusted so that it throws a small amount of soil into the rows to smother weeds between the garlic plants. The Weedfix levels and smooths the beds, (they are still a bit rough after bed-forming). When more weeds germinate, and while they are still very small, the Weedfix is used again, and Mark goes down the rows on hands and knees, and tickles the soil between the garlic plants with gloved fingers. Weeding several kilometres of bed in the middle of winter is cold, hard work, and timing is critical. If weeding is not done at just the right time, and a bit of rain holds things up, the job can become almost impossible. The crop is in the ground for seven months and doesn’t form a canopy, so weeding must be given top priority. Mark stops watering when the third leaf of the garlic plants starts to look a bit dry. A week or so later, when some of the plant stems are starting to feel soft, and are just about to fall over, he harvests. The purples are usually harvested in early November, and the whites a few weeks later. Drying is a critical stage of the crop. Although the crop is safely undercover it can still go mouldy and be unsaleable if not dried properly. The garlic is hung on wooden rails in a large, airy shed with a wide door at each end, and one in the middle. Large fans are used to continually blow air over the crop. If the summer is particularly humid and wet, and Mark uses extra fans, and space the garlic out more than usual. This extra care pays off, as the crop dries well, with no losses. Mark lets the garlic dry for three or four weeks before cutting the roots and tops and storing on airy racks until sold. Any damaged bulbs are kept back for seed, as long as they are clean. The purple garlic throws up seed heads, and the “scapes” (immature flower heads of hardneck garlics) are very good in cooking. He has tried to market the scapes, but with little success so far. The roots, tops and other trash from cleaning are fed to the cattle and sheep who come running and eat it all with delight! Like many farmers, Mark appreciates their natural environment and make efforts to enhance it. When he bought the property, there was a depression where a few acres of old grey and yellow box trees were growing. One grey box tree is a canoe tree. Even though it is 5km from the nearest watercourse, there was a flood hundreds of years ago and aborigines cut bark from this tree to make a canoe. Cattle had access to the area, and there was no understorey. Then Mark fenced it off, and, with the help of neighbours and Landcare, planted thousands of understorey species through the drought years, working hard to get water to them to ensure they survived. He planted individual species in clumps as that is how they occur in nature. Now the reserve is a magical place, full of birds, bats, lizards, wild bees and other fauna. It is cooler in summer, warmer in winter, and fog doesn’t penetrate into it. It is a most beautiful ecosystem. Mark says that it is so important for all farmers to treasure the large old gum trees they have on their farms, as they could all be gone in 100 years, changing the face of the Australian countryside forever, if farmers don’t fence them off and plant an understorey. Then the whole ecosystem will be healthy, the trees will live a lot longer, and new trees will progressively grow to take their place. It also becomes a place of great beauty, where farmers and their families can relax, appreciate nature, breathe freely and re-energize themselves.